Getting comfortable in your vehicle is always a struggle. 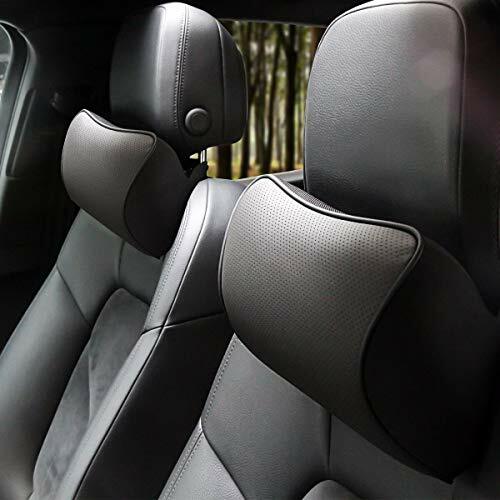 Even if you have a nice luxury car with leather seats, chances are you’ll experience some discomfort if you’re in the car long enough. And if you’re stuck in traffic, or on a long road trip? Well, then that discomfort turns to stiffness, and that stiffness turns to soreness, and next thing you know, it hurts to walk for a few days. While car seats can cause some pain in your back and legs, they do most of their damage to your neck. The way you have to sit in a car, especially if you’re the driver, puts a lot of unnecessary strain on your neck. Head rests help provide some support, but they don’t exactly alleviate the discomfort. That’s why headrest neck pillows were invented. Headrest neck pillows help give support and comfort to your neck, to keep you from getting large knots and tightness on your long drives. And if you’re in the passenger’s seat, or the rear seats, car neck pillows can provide a comfortable spot for you to relax and maybe even fall asleep. We love car neck pillows, and as with most car accessories, we have a few products that are our favorites. Thankfully, you can shop for many neck pillows online. 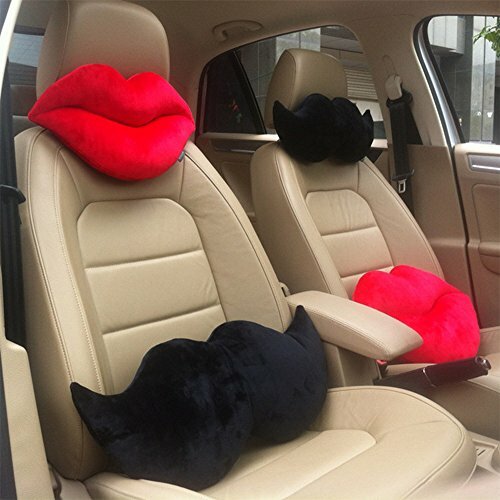 That’s exactly what we’ve done, to find the car headrest pillows that we think are the best of the best. The Excel neck pillow is pretty simple, but sometimes simple is a good thing. This is definitely one of those times. We were very impressed with just how comfortable the Excel Softest Auto Car Neck Pillow, as well as how much it kept knots and general tightness from occurring in the neck. One of the best things about this product is how easy it is to both install, and adjust. 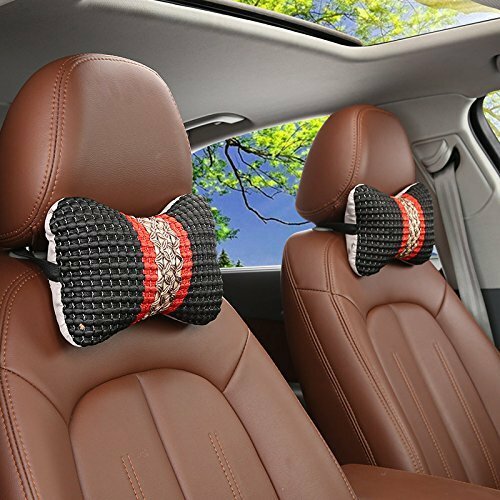 Not only can you adjust it easily, but we found that it stays in place following the adjustment; you don’t have to keep tinkering with it every few minutes, which definitely isn’t the case for many of the car neck pillows on the market. For such an affordable product, the Excel is designed very well. It’s made out of strong material with quality stitching, so it’s very durable, and a pillowcase is included so that it can be easily washed. We tried this product on short rides, and on long rides, and we really don’t have any complaints whatsoever. There’s only one way to accurately describe the Sojoy Leather Car Neck Pillow: pure luxury. This model is truly outstanding, but it’s not just the leather exterior. The Sojoy model is an orthopedic pillow, and the results show immediately. The description said that this pillow would help with our posture. Well, we were more than a little dubious as to how a little neck pillow could help our back. Color us believers, because this pillow instantly changes the way that you sit in the car; you’ll be both comfier, and healthier with this pillow behind your neck. One of the best things about this product is that Sojoy offers both a soft and a hard version, so you can find the pillow that is ideal for you and your neck. We found that both are exceptional, and even helped us get rid of muscle tightness that was in our neck. If you’re concerned about the health of both your back and your neck, there are few products under $20 that can help you as much as this one. It’s a must-have. The Sly Car Neck Pillow is one of the most affordable options we’ve tried, but don’t let the price fool you: this neck pillow is for real. We experienced not only great comfort when using this pillow, but also an improved posture. It wasn’t the very best pillow we tried on short trips, but on long trips this pillow is truly elite. Made of 30% wood fibers and 70% cotton, this pillow is not only comfortable, but it is breathable, so that it doesn’t take on odors from your body. And even if it does, it features a removable pillowcase that can be washed. The Sly Car Neck Pillow is not the softest pillow available; in fact, it’s pretty hard. In general, we liked that, but it definitely isn’t everyone’s cup of tea. If you’re looking for a a cloud or a marshmallow to rest your head on, this isn’t it. If you’re looking for firm and comfortable support, well then, this is probably the pillow for you. The elastic bands make it easy to adjust, though they’re rather small so you often have to remove your vehicle’s headrest in order to properly attach this neck pillow. Once it’s on though, you’ll likely be very happy. Few things in the world are as comfortable as memory foam. It only follows that a memory foam car neck pillow is about as good as it gets when it comes to car comfort. 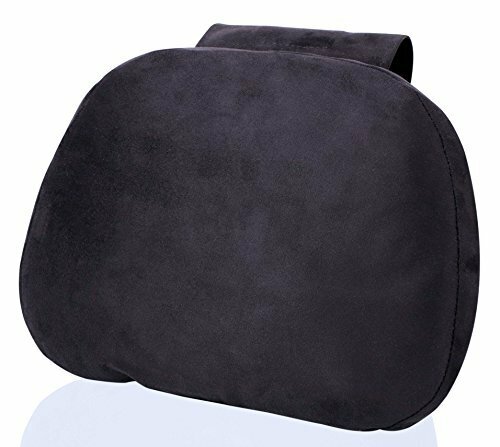 There are more than a few memory foam car neck pillows on the market, but one of our favorites is the Aukee Car Headrest Pillow, which pairs heavenly memory foam with incredibly comfortable and durable leather. We found that the Aukee Car Headrest Pillow was the perfect amount of firmness: it was comfortable enough to sleep on if you’re a passenger, but firm enough to maintain your posture and improve your circulation, whether you’re in the back seat or the driver’s seat. 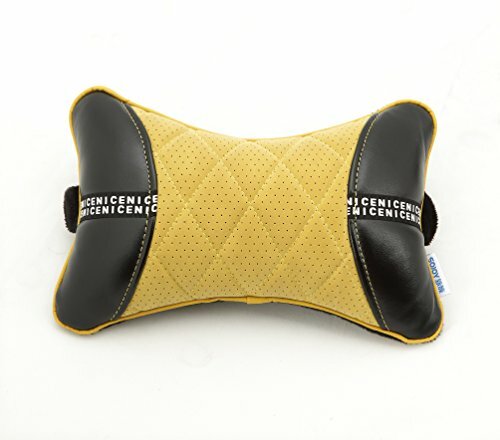 Despite the leather, this headrest has breathable moisture absorption, to keep it from getting overly clamy, even on a hot day. And just to add the cherry to the Sunday, the memory foam is environmentally friendly, and the pillows are very good looking, and available in three different colors to match your car perfectly. When it comes to car seat headrest neck cushion pillows, the Aukee model is truly as good as it gets. Our other favorite memory foam car seat headrest pillows come from GoToShop. This model combines memory foam with a unique shape that is reminiscent of a race car’s seats. The headrest itself is quite long and large, and slightly wraps around the shoulders and neck to create a holistic memory foam experience from the shoulders up. While it looks a tiny bit silly, it really works; we are in awe of just how comfortable the GoToShop VIP Luxury Memory Foam Cushion seat headrest pillow is. You can’t adjust it too much, but the pillow is big enough, thick enough, and comfortable enough that that doesn’t matter too much; you can find a way to get comfortable regardless. That said, this isn’t the perfect seat pillow for everyone. It’s definitely bulky, and it’s a little too firm for some people. It feels at times more like it was prescribed by a physical therapist than by a mattress store. So if you’re looking for the softest, coziest neck pillow, you should probably keep looking. But if you want a large, amazing memory foam pillow that will help keep your neck happy and healthy, this may be perfect for you. We couldn’t let our list end without getting a little fun with it. That brings us to the great folks at A.B Crew, who created a seat headrest set in the shape of lips and a mustache (they also have a dapper lady and gentleman set, as well as a King and Queen pair). While these pillows are obviously a bit gimmicky (but awesome! ), they’re actually great quality as well. We were surprised to try these and find out that they’re very, very comfortable. The fabric is top quality, making these headrest pillows very soft and comfortable, and surprisingly durable as well. Of course, if you’re buying these you’re probably buying them mostly for the fun looks. But take it from us: cool aesthetic or not, these car seat headrest neck pillows are the real deal, and feel outstanding whether you’re driving, or taking a nap in the passenger’s seat. We loved them, and so will you. As you can tell by this list, there are a lot of different headrest neck pillows on the market. From the therapeutic, to the relaxing, to the cute, you can find just about anything in the world of headrest pillows. While we strongly recommend all six of the headrest neck pillows listed here, it’s important to take some things into consideration before purchasing one. Do you want your neck pillow to primarily be for luxury and comfort, and to help you with your posture, circulation, and stiff muscles? Do you care about the aesthetic, and how much are you willing to spend? What types of materials do you prefer? There are six right answers, but no wrong answers when it comes to choosing a car seat headrest neck pillow. What matters is finding out what is best for you. 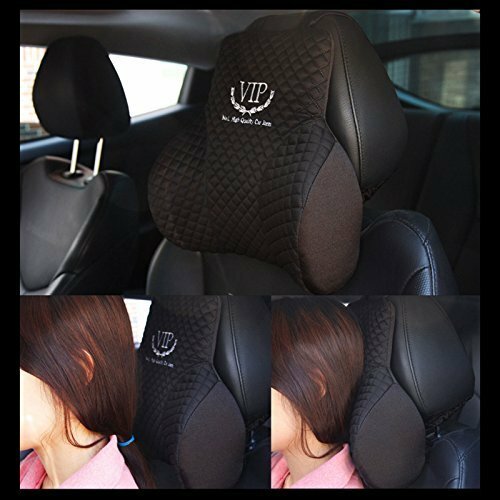 Car headrest neck pillows can make all the difference in the world, whether you’re a driver or a passenger, are on a short ride or a long trip, or have neck tightness or not. If you find the right headrest neck pillow for you, your neck, shoulders, and back will thank you, and you’ll have a much nicer time whenever you get in the car. For more car accessories, check out our article on the best big and small RC cars to buy!